Excess gum over the teeth can affect the aesthetics of your smile and make them appear small, which often leads to people feeling self-conscious when they smile. At the Dental Studio we provide gum contouring as an effective treatment to remove excess gum tissue, thus enhancing smile aesthetics and boosting confidence. We also contour the gums as part of a smile makeover to give the smile a perfect shape. During the procedure excess gum tissue is trimmed away through the use of dental laser technology. This removes unwanted gum tissue with incredible precision, accuracy and cleanliness. The procedure is carried out under local anaesthetic to prevent painful symptoms. We will discuss how much gum tissue is to be removed during an initial consultation to make sure we achieve the results you desire. Using laser technology greatly decreases the time needed for recovery as it cuts and seals the tissue to prevent blood loss. This means stitches and repeat appointments are not needed and the healing process can be over in a matter of days. The use of lasers is much faster than scalpel treatments and can instantaneously trim and seal gum tissue. 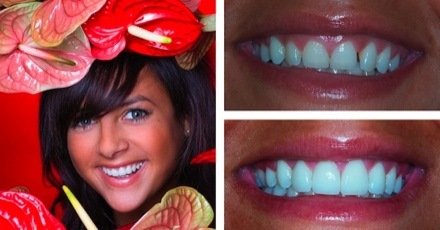 ‘Gummy smiles’ can be treated within a single visit to greatly enhance the appearance of your smile. All the specifics of the gum contouring procedure will be discussed during an initial consultation to make sure you are happy to go ahead.